LOS ANGELES, California (CNN) -- A reward for information on who set a fatal wildfire that has been burning north of Los Angeles for almost two weeks has been raised to $150,000, officials said Tuesday. 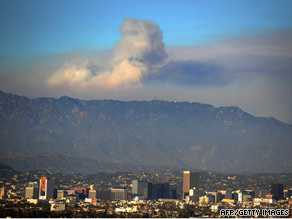 Smoke from the Station fire could be seen over Hollywood, California, on Saturday. The Los Angeles County Board of Supervisors agreed to offer $50,000 for "information leading to the arrest and conviction of the individual(s) responsible for the Station fire," according to a statement from Supervisor Michael D. Antonovich. The board's reward is in addition to the $100,000 reward announced by Gov. Arnold Schwarzenegger on Friday. The Station fire has charred 160,357 acres, making it the eighth-largest wildfire in California since 1932, according to the California Department of Forestry and Fire Protection. About 4,500 firefighters are battling the blaze and have contained about 60 percent of it, said U.S. Forest Service Fire Chief Mike Dietrich. Firefighters estimate the blaze, which began August 26, will be fully contained by September 15, Dietrich said. Authorities said last week the fire was caused by arson. A homicide investigation has been initiated into the deaths of two firefighters who died in a vehicle crash while attempting to flee the flames. Ten people have been injured in the Station fire, Gwen Shaffer of the U.S. Forest Service told CNN. The fire has destroyed 78 homes, two businesses and 88 other buildings, said Ron Watson, assistant chief at the Los Angeles County Fire Department. Thirteen homes, one business and 30 other buildings also were damaged, he said. The wildfire has also threatened about 10,000 homes and 500 businesses. The estimated cost of the fire so far is more than $43.5 million, Antonovich said.